Botticino at the Trident BKC is an unusual restaurant. 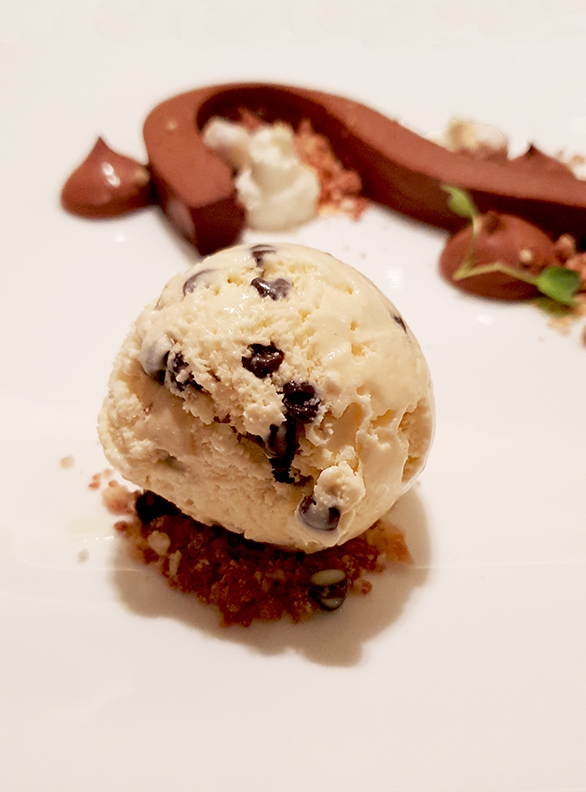 While other five-star Italian restaurants in Mumbai are headed by an Italian chef, Botticino in the last few years, if not always, has been headed by an Indian (Trattoria doesn’t count: that’s Indianised Italian comfort food). Botticino also does not even pretend to be a traditional Italian restaurant. It’s doesn’t quite reach the level of Modern Italian; perhaps the best way to describe it is Italian inspired or Italian centric. The ingredients, the flavours, the techniques are Italian; the plating is French. It’s not the place you’d want to take a nice Italian nonna. I dined there often when the hotel opened, but lost touch with the property over the years. 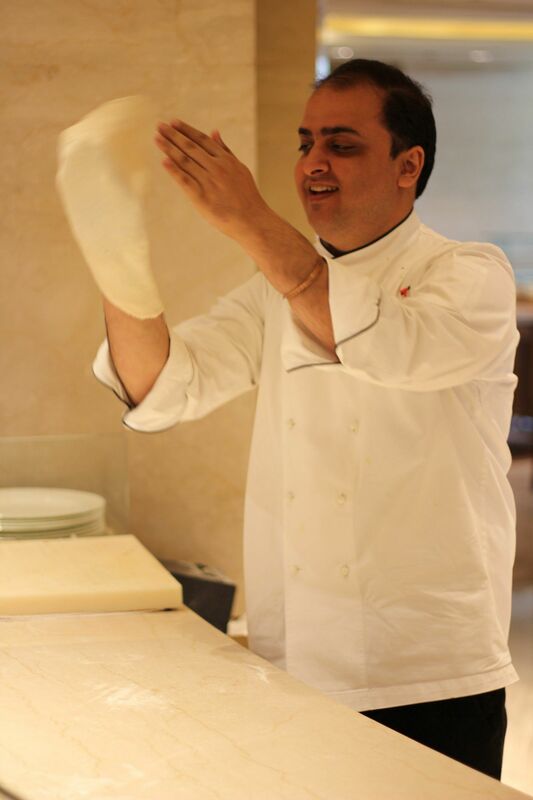 A few years ago I reconnected with the property when Ashish Bhasin who took over as Executive Chef of the Trident BKC . Unlike many chefs, he’s pragmatic about both praise and criticism. He’s not swayed by the former or mortally offended by the latter. I have not liked everything he has done; he has disagreed with some of my feedback. With Botticino’s last menu we agreed to disagree. I thought it was below par, Bhasin maintains that it was a case of a bad day or a one-off bad meal. In 2016 Bhasin invited me to Botticino and I was amazed at the meal Chef Sushil Multani, who was heading the restaurant, put out. I put Botticino on my list of top 5 Italian restaurants in Mumbai. When Multani moved on last year Chef Siva, who was previously at Le Cirque, New York, took over the reins. While I liked a few dishes, I felt not enough thought had been given to many others. Some dishes were badly plated, others lacked flavour. The new menu has won me over again. At the risk of succumbing to hyperbole: it was stellar. Not a grain of salt was out-of-place. The twice cooked mozzarella is a little disarming, you expect the springiness of a bocconcini, but get the creaminess of a burrata. Tart tomatoes and mildly bitter aubergine puree balance the richness of the cheese. A nutty, rich robiola from The Spotted Cow Fromagerie is paired with spicy argula leaves, crushed black pepper, earthy black truffles and sweet onion marmalade. Tuna tonnato, a mayonnaise-based sauce from northern Italy is sandwiched between two thin mille-feuille wafers. I’d have preferred an open-faced version, which I think would have looked better, made it easier to eat and the pastry would not suppress the flavour of the tonnato. Sharp and sweet, the apple and balsamic glaze envelopes the juicy chicken while the crunchy broccoli provides a textural counterpoint. 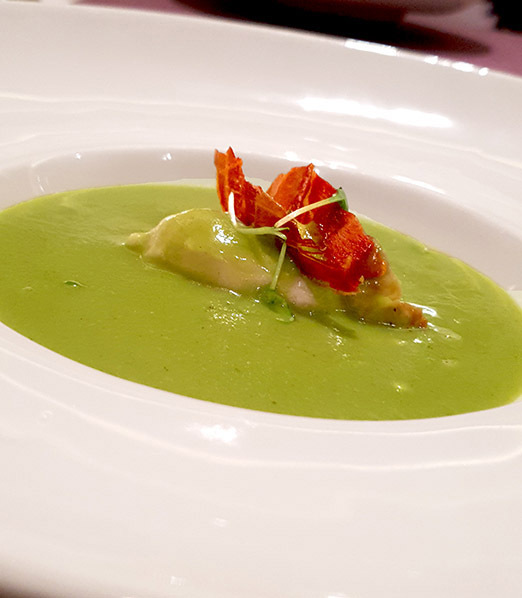 The play on textures follows through in the asparagus soup, which surrounds an island of mortadella mousse topped with a crisp, pieces of prosciutto di Parma. With the pastas the focus is on complimentary flavours: the sweetness of the butternut squash is elevated by the sweet citrus crunch of sous vide cooked candied orange and the light saltines of the parmesan fondue. The tubetti pasta seems misnamed (it means little tubes and is a short pasta for soup); cannelloni might be more appropriate but I find no fault with the bittersweet chicken liver filling nor the accompanying mostarda, a mild mustard-flavoured fruit preserve. Bhasin warns us that the red wine risotto will be sharp and acidic. And it is: in a way that the Indian palate might not easily accept. I find the 21-day, wet-aged, duck is as plump, juicy and fatty as a pork chop with an equal rich depth of flavour. 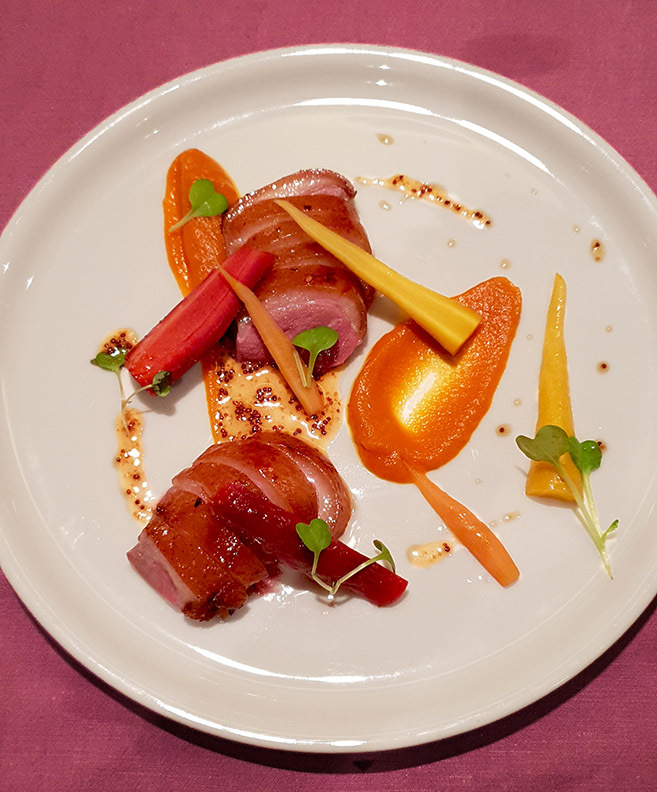 The assiette of carrots and carrot puree add a touch of crunch. I’m not a chocolate fan, but the textures of chocolate wove bitter and sweet chocolate together quite effortlessly with the smoked chocolate chip ice cream adding a layer of temperature to the textures. Under Bhasin’s guidance, Siva has executed a menu that is intelligent and beautifully designed and presented. Botticino’s back on my list again. Loved reading this and will look forward to read you more.